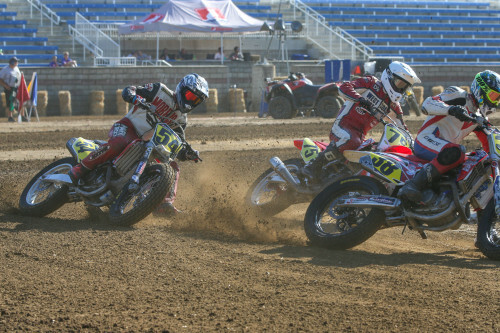 American Flat Track Rider Bio - Jeffrey Carver Jr.
Jeffrey Carver Jr. won the Castle Rock TT in 2013 and the Lone Star Half-Mile in 2017. 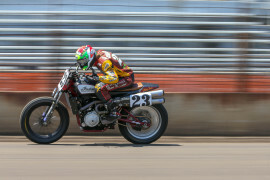 Riding the Roof-Systems Indian Scout FTR750 for the 2018 American Flat Track season, he’s earned five podium finishes and nine top-10 finishes this year. 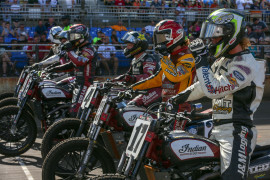 The Illinois native rocketed to his first victory of the season at the 2018 Springfield Mile after an intense five-rider battle for the lead, throwing down fast laps to claim the victory 0.819 seconds ahead of Jared Mees. Carver currently rides the No. 23 Indian FTR750 for Roof Systems of Dallas, Texas, Ben Evans Racing and Indian of Metro Milwaukee. 2017 Jeffrey Carver Jr. was amazingly consistent in 2017, scoring 16 top-ten finishes, reaching the podium three times and scoring an AFT Twins win at Texas on his way to fifth overall for the season riding for Ben Evans Racing, Carver's BBQ, Mack Daddy and Arai Helmet. 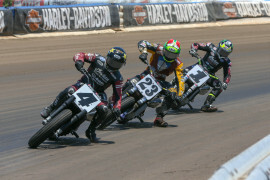 Earned five Top 10s including a podium at Rolling Wheels Half-Mile, finished the season 11th in the points. Raced for BriggsAuto.com. Made all but three GNC1 Mains, finishing 10th in the final point standings. 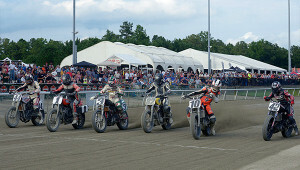 Best finish of second came at the Delaware Half-Mile. Raced for Don’s Kawasaki. 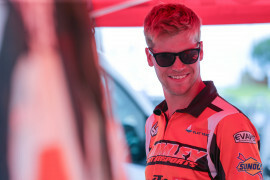 2014 Carver ended his GNC1 season strong, qualifying for seven of the last eight main events. He had three top 10s, including a pair of eighth place performances to finish the year at Calistoga and Pomona. 2013 Excelled mainly in GNC Expert Singles competition, finishing fourth in the points. 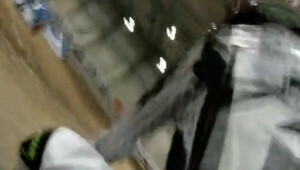 Raced for Kiesow Racing. 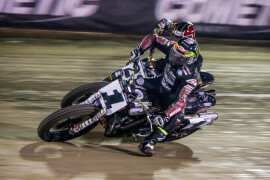 2012 Seven top 10 finishes helped him land in 9th place in the GNC Twins point standings. Best race came at Hagerstown where he recorded a third place finish. 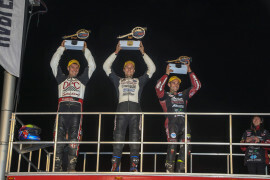 2011 Competed as a GNC Expert, earning a podium at Springfield. Raced for Eddie Adkins Racing/Van's Yamaha. 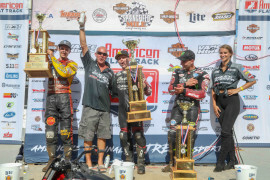 2010 Won the AMA Pro Flat Track Motorcycle-Superstore.com Pro Singles Championship and the Steve Nace All-Star Flat Track Series Championship. 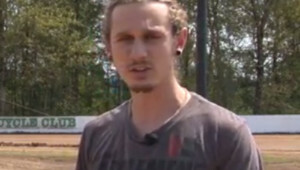 2009 Finish third overall in his first season of Pro Singles, earning a victory in Pomona, CA. 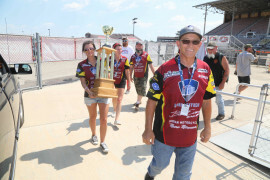 2008 Won the AMA Pro 450 Pro Sport Hot Shoe overall championship. 2007 Won the AMA Dirt Track Horizon Award. 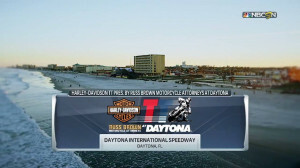 Castle Rock TT Track Walk with Jeffrey Carver Jr.
Can ‘The Wizard’ repeat at the 100th running of the fastest Mile in the land?